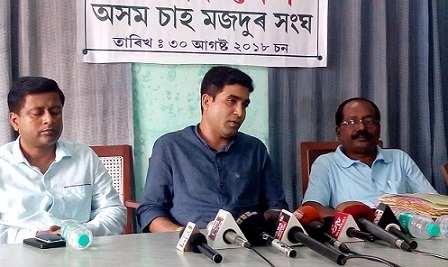 The Assam Chah Mazdoor Sangha (ACMS), the State’s largest tea labourers’ body on Thursday urged the tea industry to pay bonus to the workers three weeks before Durga Puja. The union also asked the tea gardens to pay the maximum rate of bonus that is 20% to the labourers. This year, puja will begin on October 15 and the ACMS had already issued a circular to its 800-odd affiliated tea gardens to initiate the bonus payment. The minimum bonus for tea garden workers under the Payment of Bonus Act, 1965 is 8.33% while the maximum is 20%. All permanent and temporary workers who has worked for a minimum period of 30 days are entitled to the benefit. “Puja bonus is a sensitive and emotional issue for the workers. We don’t want any sort of disturbances due to bonus-related issues. Therefore we have asked the tea industry to pay the bonus amount well in advance,” Gowala added. He said for Assam Tea Corportion(ATC) gardens the government have announced Rs 99 Crore for it’s revival under the instruction of Supreme Court. “Now the government is indulging into politics on the issue on the release of Rs 99 Crore for ATC tea garden. We appeal the government not to indulge them in politics,” Gowala added. Gowala condemned Industry Minister Chandra Mohan Patowary for rejecting the idea of wage increment for tea garden workers of the state. Patowary recently said that ACMS and other organisations are playing politics by raising the wage issue of workers just before election.